Dusty streets take you into town and back a few centuries. The brightest spot in the northwestern corner of Argentina was shaping up to be disappointingly dull. 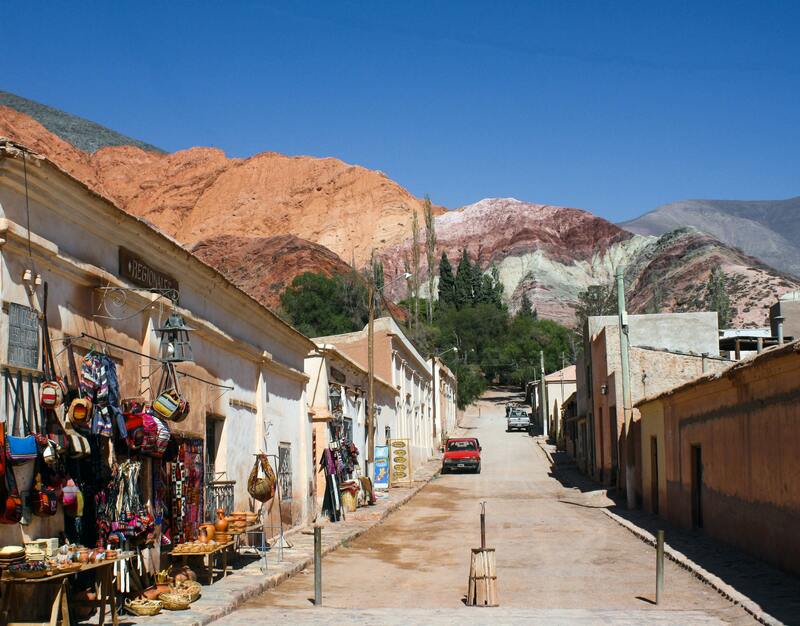 Lured by a natural wonder, the likes of which I had never seen anywhere else, I boarded an early-morning bus in the city of Salta for the two-hour drive north. 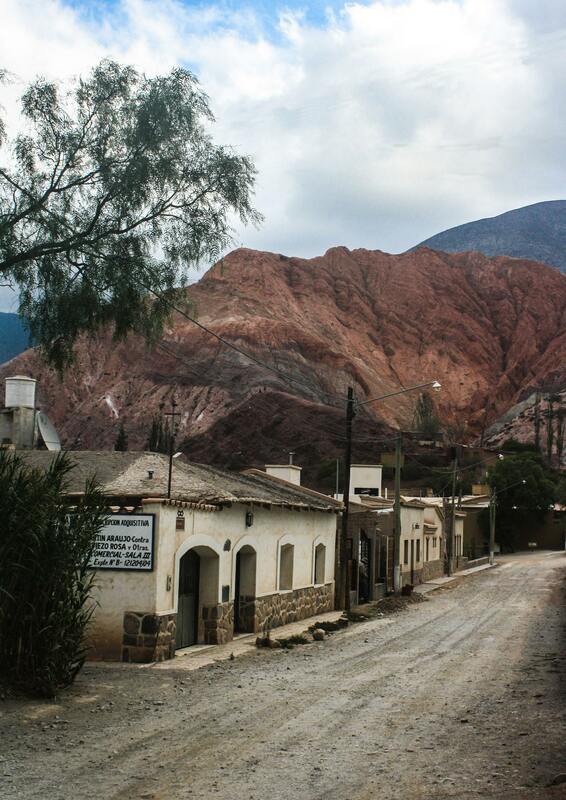 My destination was Purmamarca, a tiny, dusty town of fewer than 1,000 residents in the province of Jujuy. With completely overcast skies weighing down upon me, I was doubtful that the grandeur of the Cerro de los Siete Colores would live up to my expectations. The Hill of Seven Colors is best viewed in morning light, and I was afraid that, unlike a cloudy day around Lake Bled, Slovenia, the lack of sunshine here would make this side-trip a bust. Glimmers of hope started to appear as the monochromatic sky began to break up. Little shards of blue punctured the gray sheet above. By the time we had doubled our altitude, to about 7,600 feet, along the road that sliced through the Quebrada de Humahuaca, with fields of cacti and the occasional llama, we had left the clouds below us, and a perfectly glorious day had arrived, just in time for me to catch my first view of the famous hill from the road leading into town. 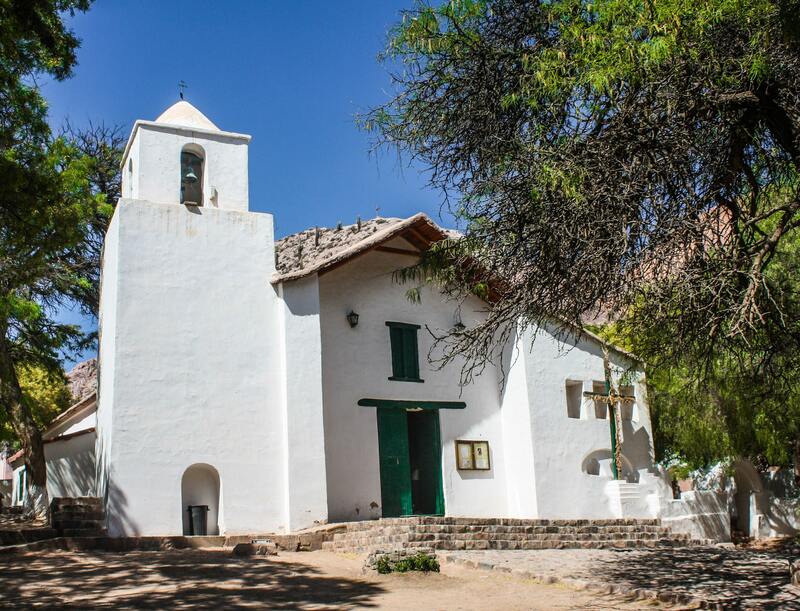 The Iglesia de Santa Rosa de Lima is the heart of the plaza and of the entire village itself. Like a ragged area chart filled in with colors from a Pantone color chart or a box of extravagant marzipans, the famous hill stands in arresting contrast to its surroundings. Rocky and treeless, and shorter than the dull slate-green hills behind it, the Cerro de los Siete Colores leapt out at me, with its orange, honey, paprika, lilac, and violet colors appearing to have been painted onto a stone canvas rather than resulting from eons of geologic turmoil. I couldn’t wait to see it close up, but I quickly succumbed to Purmamarca’s other charms first as soon as I stepped off the bus at the edge of town. 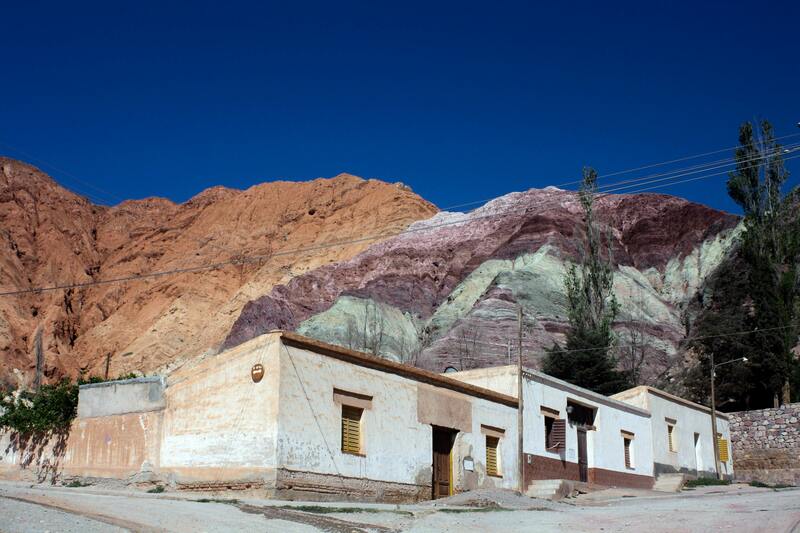 The dusty, red-soil lanes of this Andean village, whose name translates to “Town of the Virgin Land” from the Aymaran language, invited me to stroll leisurely past one-story adobe buildings with mud tiles and cardon roofs. Purmamarca predates the arrival of the Spanish, its origins reaching back to the 1500s, when it was part of the Inca Road, and it felt like nothing had changed since. The outdoor market adds splashes of color to the village’s only plaza. I emerged from one of these streets onto Purmamarca’s only plaza, the Plaza Nueve de Julio, dominated by the trio that brings visitors here once they have finished marveling at the famous hill: the nation’s smallest cabildo, or colonial town hall; the Iglesia de Santa Rosa de Lima; and the thriving U-shaped market that wraps around three-quarters of the green park before the church. Dedicated to the town’s patron saint, the Iglesia de Santa Rosa de Lima, constructed in 1648 and declared a national historical monument in 1941, anchors the town. The white walls of the simple structure gleamed in the morning sunshine, a nearly blinding light tempered by the algarrobo trees around it. The bell tower, about three stories high and capped by a little pyramid topped with a small cross, was the tallest structure in town. The green doors at the top of a set of stone steps, underneath two light fixtures and a shuttered window below the clay and mud roof, had been thrown open, allowing visitors and breezes to flow through. The silent whitewashed interior featured about a dozen rows of pews set on the brick floor, a simple staircase leading up to a simpler pulpit, a peaked beam ceiling, small and colorfully painted Stations of the Cross, and, most importantly, paintings from the 1700s from the Cuzco School artistic tradition depicting scenes from the life of Saint Rose of Lima. Tempting textiles will relieve you of some of your pesos. Outside, the market presented a livelier and more secular atmosphere. Native American men and women in vivid traditional garb and wide-brimmed hats stood behind tables laden with even more colorful goods for sale. With extremely affordable prices, you’ll be tempted to purchase a musical instrument, some pottery, or a set of silver mate cups that you never realized you wanted or needed. The astounding vibrancy of the colors used in the textiles was irresistible. You can pick up a handwoven change purse for your grandmother for $2, or a luxuriously soft, handwoven alpaca sweater for yourself for only $20. Piles of resplendent tapestries, ponchos, and blankets in every color of the spectrum — a wonderfully radiant contrast to the beige walls of the buildings around the plaza — will inevitably find their way into your luggage, their saturated hues and intricate patterns impossible to pass up. 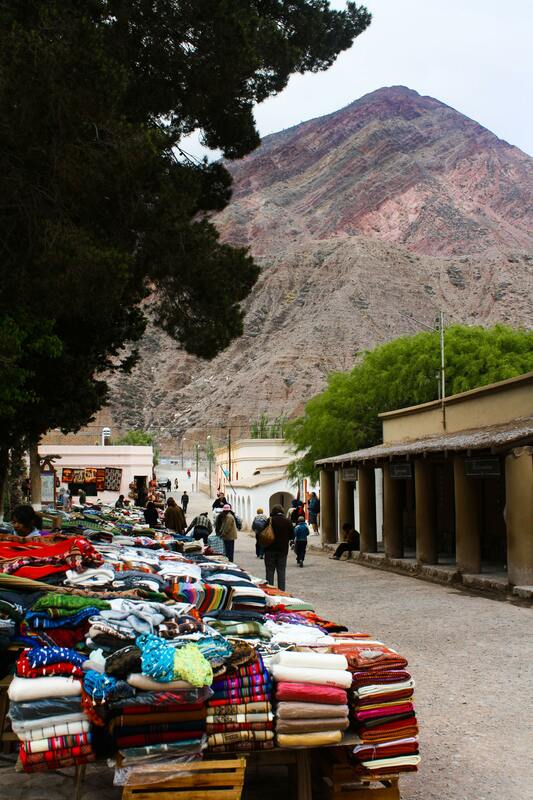 Quiet streets lead you to the base of the famed Cerro de los Siete Colores. From the market, I strolled along one of the streets leading from the plaza, slightly uphill toward the base of the Cerro de los Siete Colores. Formed around 75 million years ago as the land rose in tectonic shifts, the hill obtained its unique layers of colors from the pigments acquired by the minerals in the sedimentary strata. The stone rainbow before me blazed in the morning light, shocking against the unadulterated blue sky above. Leaving behind the bustle in the plaza and the sounds of schoolchildren playing behind an adobe wall who had this as their backyard, I embarked on the 1.5-mile trail that circles the base of the hill. Only a few other people had the same idea, and by the time I had ambled halfway around, I felt miles away from the little village just on the other side, in a magical world of impossible colors. Who could ask for a more beautiful backyard? I returned to the plaza to purchase all the items I had originally spied and admired and then picked up a couple of empanadas stuffed with beef and goat cheese. My bus back to Salta would be arriving soon, and I regretted not foreseeing that I would want to spend more time here, and most definitely overnight, to experience the town once all the day-tripping visitors had departed, to listen to the musicians who perform in the plaza in the evening, and to view the Hill of the Seven Colors as it took on different shades in the waning hours of day and perhaps under brilliant moonlight. Maybe next time. What an interesting sight, both the hill and the town. I’d definitely like to try the local cuisine and I’d also consider picking up an alpaca sweater. It’s certainly worth the trip! 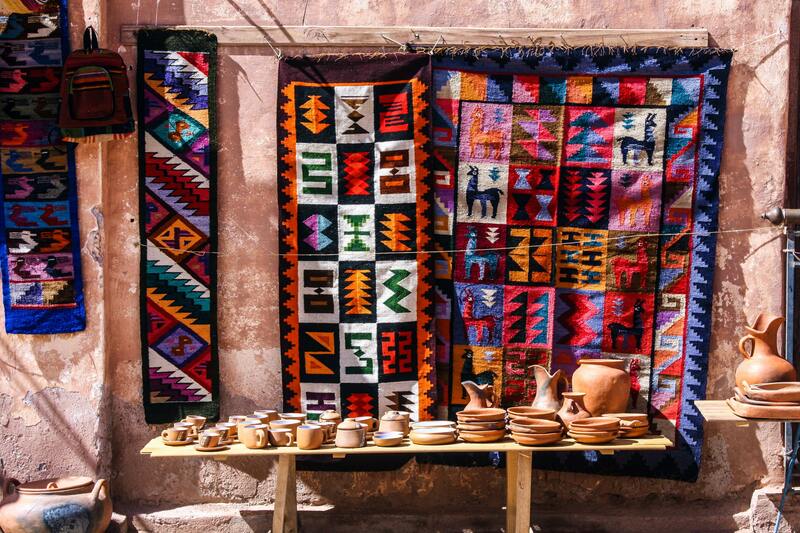 The colors and patterns of South American textiles are indeed hard to pass up! We saw equally wonderful specimens in Peru.